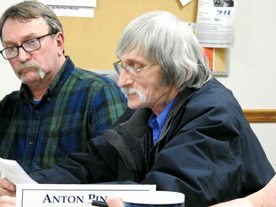 Garrett Neese/Daily Mining Gazette Houghton County commissioners Tom Tikkanen and Anton Pintar were appointed to the region’s Health Board at Tuesday’s meeting. HOUGHTON — The County Board reappointed Tim Palosaari as vice chairman in its first meeting of 2018. Meeting days remain on the Tuesday following the second Monday of the month. The exception is the October meeting, which will take place on Oct. 16. Palosaari and commissioners Anton Pintar and Tom Tikkanen were appointed to represent the county on the Western Upper Peninsula District Health Board. Chairman Al Koskela was appointed to the Copper Country Mental Health Board.